The latest version of HWiNFO32/HWiNFO64 is 4.50. The plethora of information to display including Fan speeds, CPU, HDD, and MOBO temps in the notification tray makes this thing perfect for me. 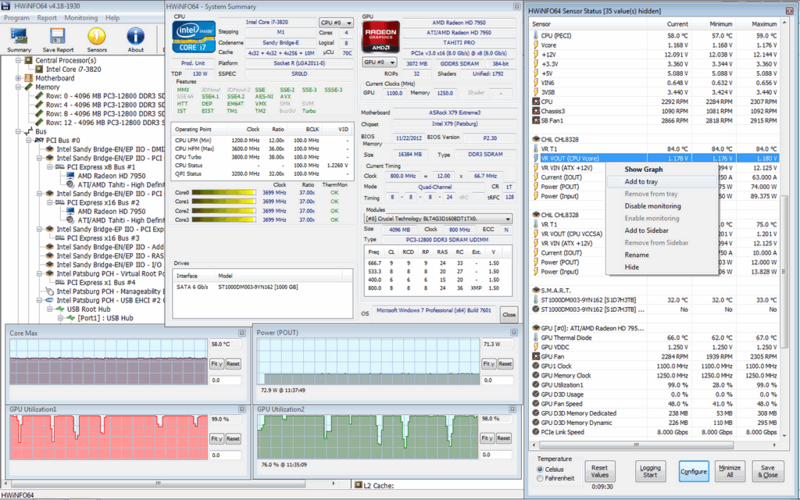 I let Process Explorer handle the memory/cpu/network/etc usage and let this thing display cpu/mobo/etc temps and I get a wealth of information in one area. It doesn't use too much resources either. Highly recommended. @Ateka: The most important part -- The driver is installed when you run and it is removed after you close it. The HKCU key is settings and not important. It's not stealth, it requires admin rights but it IS portable. The policy of this site is to list even kind-of-portable software and give enough information to let YOU decide if each application is portable. I believe SIV doesn't require admin rights. Judging from the screenshot - it looks like it reports the same amount of information. @tom: That's not a definition of portable software, rather a requirement for admin rights. Without admin rights it's not possible to access hardware so impossible to make such a tool. It has been approved by PortableApps and LiberKey, so indeed it IS portable. And why should that mean it's not portable ?? The driver is uninstalled after HWiNFO32 is closed. Morover, you can tell HWiNFO32 not to remember settings in the Settings menu.